The 2019 SURCP State of the Beaver Conference will be held in Canyonville, OR a short 4 weeks from now. Having traveled from Massachusetts to attend all but the first one, I can personally attest to the high quality of the presentations and the incredible energy that is created when so many beaver devotees are gathered in one place. Having this conference once every two years is not enough. I am really looking forward to it! I’m excited to report that the Beaver Institute will be at the Conference to share the progress we are making promoting progressive beaver management across North America. The number of visitors to our Beaver Institute website continues to rise, and is now averaging 50 visits a day. The website provides a wealth of information about the value of beavers and the importance of coexisting with them. 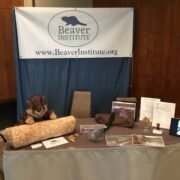 To help spread the beaver gospel this fall we exhibited and taught at Conferences and Workshops. We receive e-mail inquires every day and provide additional guidance on progressive beaver management techniques for a wide variety of beaver-related concerns. And our free Do-It-Yourself flow device installation training materials are very popular. I am especially excited that our Professional Beaver Corps Training Program is now in full swing. Our first professional Beaver Corps students are from Maine, New York, Colorado, and Oregon. They are a highly motivated group. We are currently accepting one additional student per month, with plans to increase the number of students as funding permits. Our goal is to have professional flow device installers in every U.S. state and Canadian Province within five years. Another exciting Beaver Institute project is a new partnership with the University of Massachusetts Transportation Center (UMTC). This group creates trainings for Highway personnel. We have been working closely with the UMTC/ Baystate Roads Program for several months now, and our introductory training video on non-lethal beaver control for highway personnel is nearly complete! In addition, we will be teaching six hands-on workshops with Highway Departments across Massachusetts in the next five months. These are exciting times for Progressive Beaver Management. I look forward to sharing more details about our unique, game-changing Beaver Institute projects in my presentation next month at the 2019 SURCP State of the Beaver Conference. I hope to see you there!